California’s new Democrat supermajority used Monday’s usually congenial legislative swearing-in ceremonies to ram through Assembly and Senate resolutions insisting President-elect Donald Trump abandon his immigration deportation policies – at least in California. California is home to the largest illegal-alien population in the country, with 35 sanctuary cities. President-elect Trump has vowed to build a border wall and deport immigrants that have a criminal record, which he estimates to be two-three million. “I didn’t hear him make the comment,” he added. Apparently the California Senate is basing state policy on a 60 Minutes interview. California lawmakers swear an oath to uphold the law. Yet they are vowing not to uphold the law. 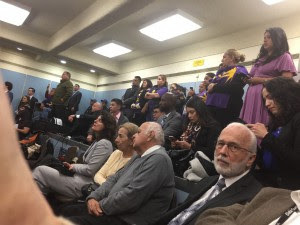 According to de Leon, and Sen. Ricardo Lara, “Thousands of illegal aliens in California are terrified.” However, De Leon and Lara failed to fairly report is how their official media blasts are more likely terrifying immigrant groups. De Leon said that throughout the election, the President-elect made many disturbing comments. “I am guided by principles of justice. There is no greater policy area than immigration,” he added at the press conference. De Leon said Trumps “heated rhetoric” has families living in fear. “School children are living in fear and experiencing discrimination,” and added that they could come home from school to find mommy has been deported. 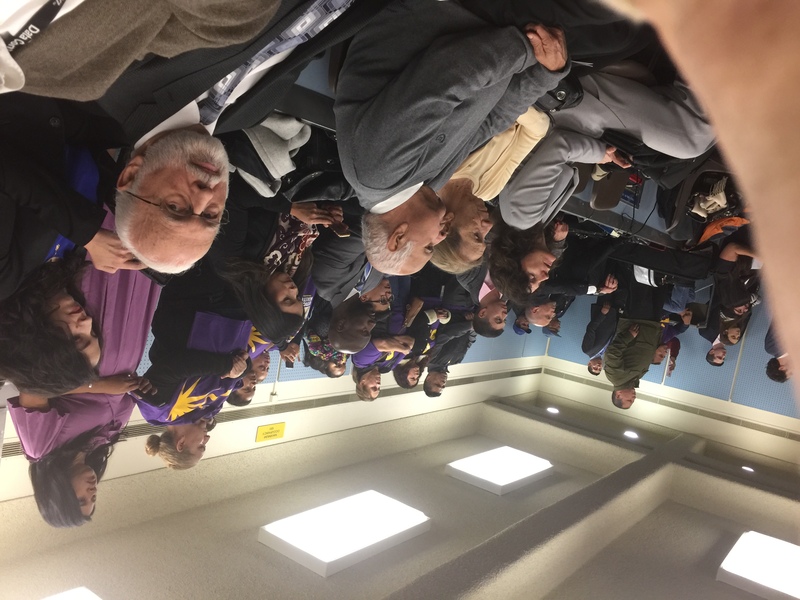 Both resolutions, and the subsequent dog-and-pony-show at the credentialed-press-only conference, which was packed in by purple t-shirt-wearing SEIU members, never recognized that providing education, health care, law enforcement, and social and government services to illegal aliens and their dependents costs Californians $25.3 billion per year, according to a 2014 study released by the Federation for American Immigration Reform. “Civil rights, healthcare will come under attack, transportation and affordable housing. An unnecessary onslaught coming out of DC,” Rendon said. 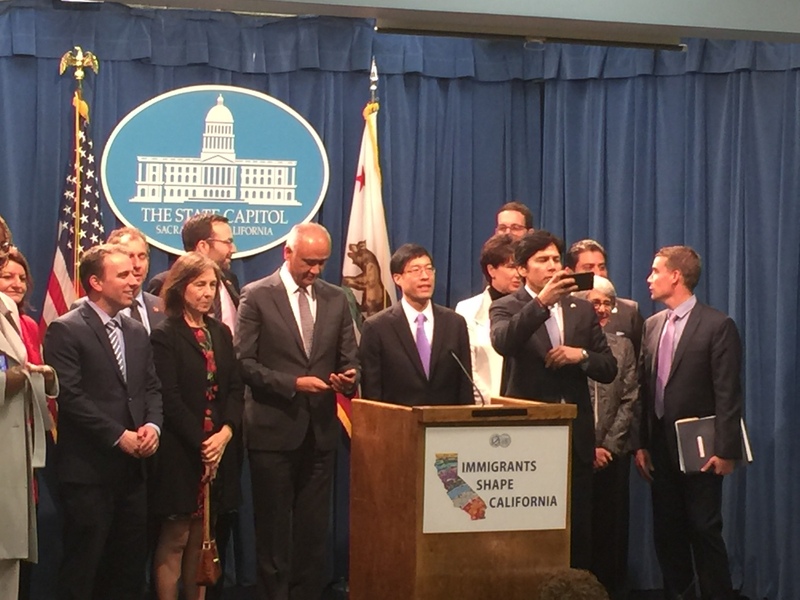 “California wants no expedited removal, no mass deportation, no more bigoted rhetoric,” he added. California’s sanctuary city movement hinders immigration enforcement and shields illegal aliens from federal officials as a matter of policy. 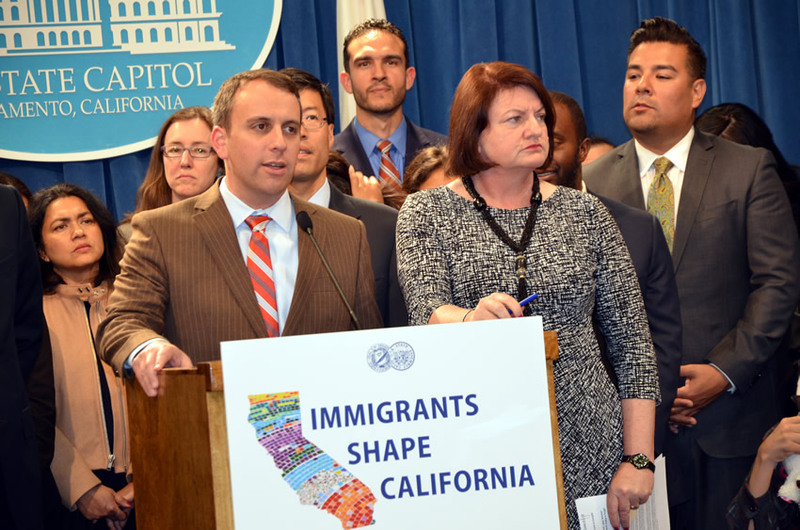 Beyond the legalities, illegal immigrants are a severe economic drain on California’s already strained budget costing California taxpayers more than $25 billion in services. Trump has also promised to “immediately terminate” the 4-year-old Deferred Action for Childhood Arrivals program created by President Obama through executive order, which amounts to a fast track to permanent amnesty. The DACA program currently protects nearly 800,000 young people, half of them Californians. Both HR4 and SR7 will be immediately sent to President-Elect Trump by California Democrats. 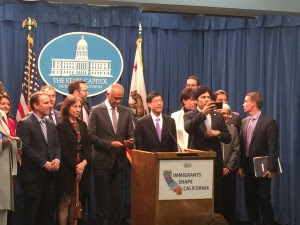 Democrats also introduced two other bills: SB 6 by Sen. Ben Hueso to create a state program to fund legal representation for illegal aliens facing deportation, and AB 3 by Assemblyman Rob Bonta to create taxpayer-funded training for defense attorneys and public defenders on immigration law for illegal aliens.